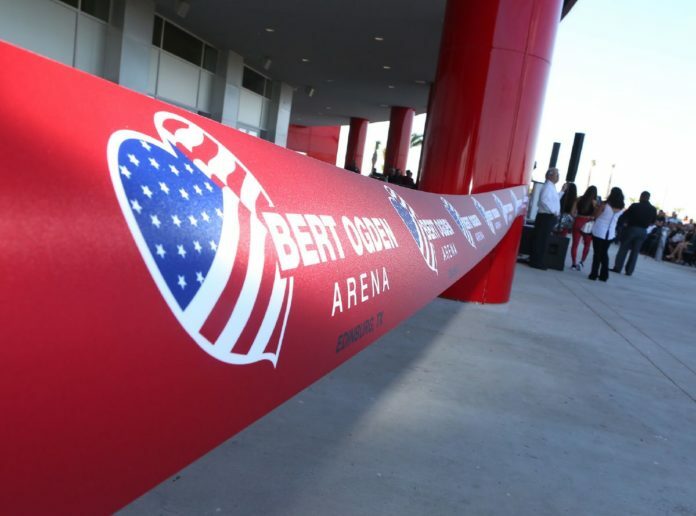 A ribbon hangs during a ribbon cutting to open Bert Ogden Arena on Monday, Aug. 27, 2018, in Edinburg. The buzz is undeniable, even before Luis Miguel takes the stage tonight. The performance by one of Latin America’s biggest entertainers inaugurates Bert Ogden Arena, a 9,000-seat, $88 million venue in Edinburg that could be a game changer not only with regard to entertainment in the Rio Grande Valley, but in other ways as well. It’s the dream, and effort, of local developer Alonzo Cantu, who says this area has gotten short shrift, both in business investment and government allocations for infrastructure, social services and other public needs. Cantu and others see the new arena as another step in the Valley’s growth and development. Its effects could be larger than many might initially expect. Longtime Valley residents might remember just a couple of decades ago, the largest entertainment venues in the area were the Pharr Convention Center and Greg’s Ballroom in Mission. Except for an occasional rock concert on the beach at South Padre Island, few major entertainment acts came to the Valley; no local facility could sell enough tickets to cover the cost of bringing the big names to the area. At the same time the Valley suffered from “brain drain,” the loss of young, talented people who left home rather than stay and build their own — and their community’s — future here. Certainly, many left because they saw few opportunities that matched their education, talents and interests. But many also cited a dearth of entertainment options: “There’s nothing to do here” was a common complaint. That made the 2010 opening of the 6,800-seat Dodge Arena in Hidalgo such a major event. For the first time the area had a venue large enough to attract major acts such as Elton John and Selena Gomez. Ice Capades and touring Broadway shows now had a place to perform in South Texas. Now State Farm Arena, the Hidalgo facility also offered a venue for professional sports. Suddenly the Valley had a professional hockey team in the Killer Bees, and the NBA’s Houston Rockets picked the Valley for its Development League team, the Vipers. Then there was the opening of the McAllen Performing Arts Center in 2016, which has since attracted high-profile Broadway tours and stage productions, including Annie, Jersey Boys and now Les Misérables in September. The Bert Ogden Arena is the next step in expanding the Valley’s sports and entertainment offerings that don’t just fill local needs. Local officials now have a modern facility that can play host to regional tournaments in basketball, volleyball and other sports. Such events will provide windfalls to local hotels, restaurants and stores. Indeed, the popular WWE professional wrestling franchise will be at the Bert Ogden Arena on Sept. 14, and the Vipers have announced their move to the Edinburg arena. Rather than compete for the same events, we expect the Bert Ogden and State Farm arenas to augment each other and offer even more entertainment options. These are quality-of-life improvements that not only can convince young Valley residents to stay here, but could attract business investors who can provide the jobs that will keep them here. That benefit is hardly incidental. More than a third of the McAllen area’s retail sales are to people from Mexico, who come from as far as Monterrey. Entertainers such as Luis Miguel, as well as Alejandro Fernandez and Marc Anthony, who also will perform at the Bert Ogden Arena this fall, will only increase the flow of visitors to the area. Tonight’s concert opens the door to a future that could bring major benefits to the Valley. We applaud all the dreamers who made it happen.